Kitchen Countertops Granite Countertops How are granite countertops made? Generally, granite countertops go through several processes, to change the undressed slab of rock into the beautiful piece of stonework on your kitchen counter. Here is a beginner's guide to how granite countertops are made. Transporting granite for stonework is not as simple as loading it onto a truck and hauling it away. Unprocessed granite stones rub against each other, grinding each other to pieces while in transport. If left unchecked, manufacturers could wind up with stone dust to work with. Trucks are usually fitted with containers that keep stones packed in tight, and prevent them from moving and bumping into each other while being transported. Once at the delivery site, stones are gently unloaded with huge cranes. Usually, these cranes are all that touch the stone while it is still unprocessed. Cutting the stones requires precision that human hands simply are not capable of. For this reason, stone-cutting saws are usually computer-aided. For countertops, the stones are generally cut into slabs between one and two inches thick. This is much thicker than the actual countertop, giving stonecutters and fabricators more leeway with which to work. Stone-cutting saws are usually diamond-tipped, to provide a sharp, hard cutting edge. After the slabs have been cut, pressurized water is used on the edges of the stone. This refines the stone and removes coarseness around the slab's rim. The water jets used for cutting stone keep water at pressures of over 100 pounds per square, and the water itself travels over 200 miles per hour. Great care must be taken to prevent injury when using these water jets. Once the granite slabs are the correct shape, they are ready to be finished. Usually, this involves sanding the piece with several buffers and different grades of sandpaper. Doing this by hand would be tedious, so most major manufacturers have machines that do this instead. The profiling phase of the production process creates the shine for which granite countertops are valued. Profiling also helps to harden and clean the surface of the piece. 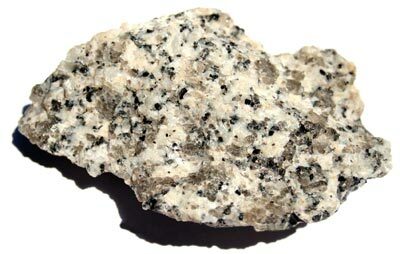 Usually, an unfinished granite countertop will break and chip, because of imperfections on the piece's surface. Profiling evens out these imperfections, and prevents further damage from being done to the piece. Depending on what is needed for the piece, some final details must be added to it before it is ready to be used. A typical kitchen countertop will probably have a hole for the sink cut into the center of the stone. Rough edges from the excised portion will again be sanded away. Clips and support pins for the sink itself are also added onto kitchen countertops. Countertops for bars may be left plain, but some customers prefer more texture in their countertop. It is usually at this point that master craftsmen take out the hammer and chisel, creating curclicues and geometric designs along the edge or in the center of the piece. Finally, the piece is wrapped in bubble plastic, secured with duct tape, and is ready to be transported and installed. The entire process, from unrefined stone to finished usable countertop, usually takes less than a day, with pieces that require heavy detailing taking more time.